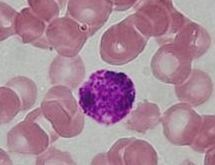 A basophil granulocyte is surrounded by lightly staining eosinophilic erythrocytes in an H&E staining. Eosinophilic (Greek suffix -phil-, meaning loves eosin) refers to the staining of certain tissues, cells, or organelles after they have been washed with eosin, a dye. Eosin is an acidic dye; thus, the structure being stained is basic and as a corollary, is acidophilic. Eosinophilic describes the appearance of cells and structures seen in histological sections that take up the staining dye eosin. This is a bright-pink dye that stains the cytoplasm of cells, as well as extracellular proteins such as collagen. Such eosinophilic structures are, in general, composed of protein. The stain eosin is usually combined with a stain called hematoxylin to produce a hematoxylin- and eosin-stained section (also called an H&E stain, HE or H+E section). This is the most widely used histological stain in medical diagnosis; for example, when a pathologist examines a biopsy of a suspected cancer, the biopsy will have been stained with H&E. Some structures seen inside cells are described as being eosinophilic, for example, Lewy and Mallory bodies. Some cells are also described as eosinophilic, such as Leukocytes. ^ Eosinophilic. Medline Plus. Accessed March 2nd, 2012. ^ Dixon, Frank J. (1986). Advances in Immunology, Volume 39. Academic Press. p. 323. ISBN 9780120224395.